Why is the school administration breaking the law just to keep the taxpayers in the dark? On July 17'th I made a Freedom of Information Law request for some bid results, because I wanted to be sure that the taxpayers' were not ripped off.. Jobs should in my opinion be given to the lowest bidder firm who meets the requirements. Freedom of Information requests are serious legal papers that must be responded to within five days. My actual request is reproduced below. 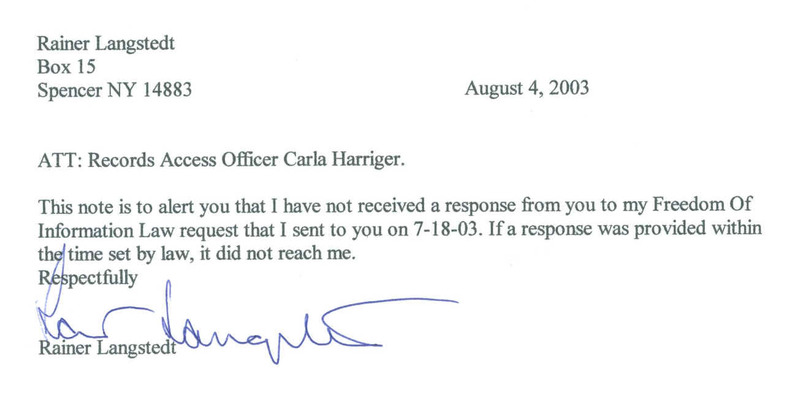 The school administration did not respond within the time set by law, I therefore sent a reminder on August 4, 2003. where I pointed out that the district is breaking the law by not responding. 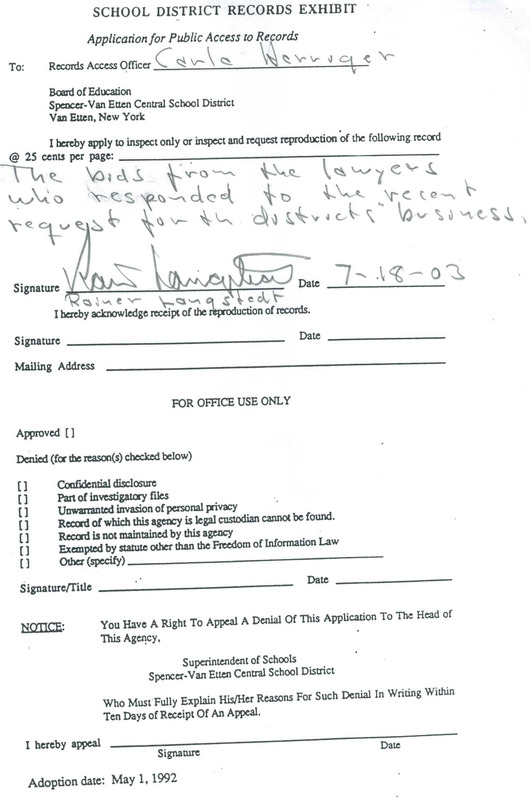 Why is the school administration risking a costly law lawsuit just to prevent the people from knowing the truth? Is that a responsible way to spend your money? Is there something in the bids that the administration wants to hide or cover up? What could there be in the bids that the administration wants to hide from the taxpayers? Was there a lower bid that met the specifications? What we do know is that the job was awarded to a firm which had done work for the district before. I have done a lot of bidding in the past 35 years. After the opening of the bids, the bids are public, and this is in fact the only time that I have been refused a look at the results. There is therefore in my mind a real bad odor around the behavior of the administration in this case. After 20% tax increases the administration should at a minimum be eager to show the public that your tax money is spent responsibly.